Our Friday Night Auction 45s Card Party begins on September 28, 7:30pm. Cost: $3/person. Games are held on the second and fourth Friday of each month. Everyone is welcome. Msgr. Henneberry will be away from the office from September 26 – October 6. During this period there will be no weekday Masses except for the Tuesday Novena Mass at 5:30pm. Join us for our annual fall bingo on Wednesday, September 26. This Sunday, September 23, is the first day of Religious Education. If you haven’t registered your child yet, you can still sign up at the first class. 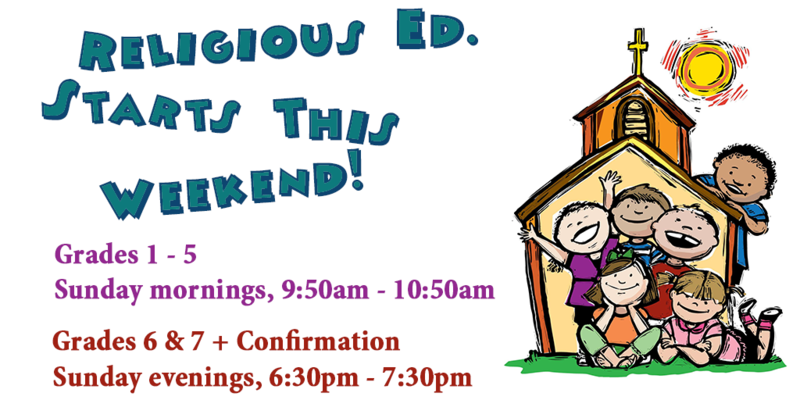 Children’s Liturgy of the Word is held on Sundays during the 11am Mass for children ages 5 – 10. The children will be called forward to go downstairs with a leader, and will return to the main community following the Offertory. 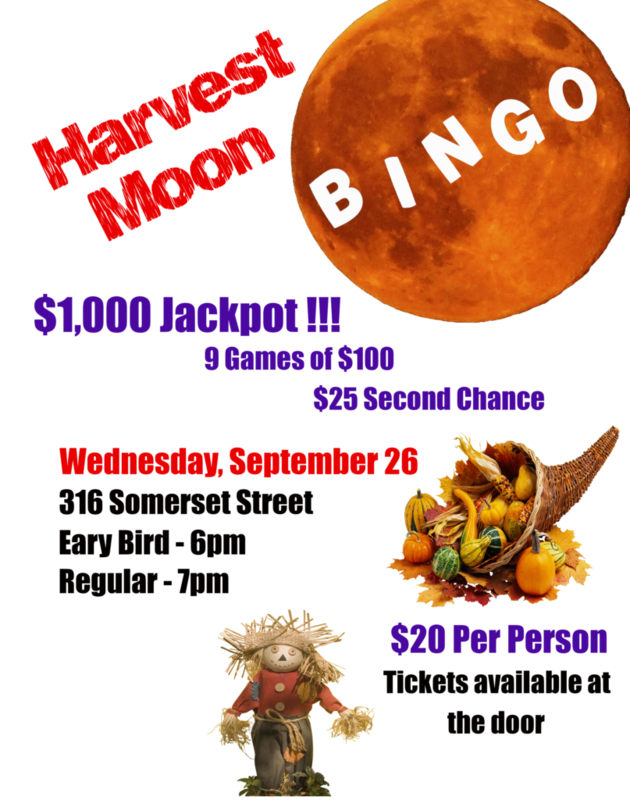 On the evening of Wednesday, September 26, the parish will be hosting its annual fall Bingo. Volunteers are always needed to help work at these major parish fundraisers. If you can volunteer a few hours of your time, please leave your name and contact information on the parish voicemail (653-6830) and one of the Bingo organizers will be in touch. If you are using Visitor, Holy Trinity or St. Peter’s envelopes, please include your complete name, mailing address and phone number so that we can provide you with income tax receipts at the end of the year. 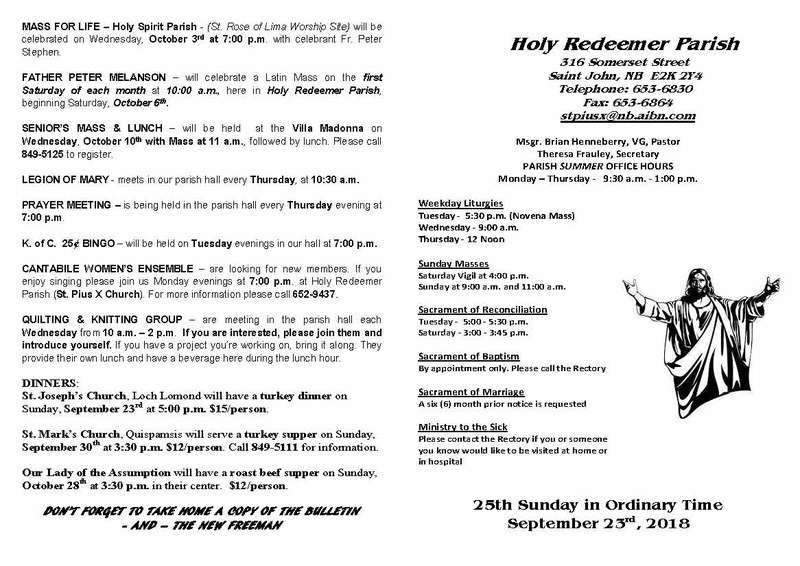 Choir practice will start on Sunday, September 23, 9:45am, in the parish hall. All children are invited to attend. The Knights of Columbus host a 25 Cent Bingo every Tuesday evening in the parish hall beginning at 7pm.